North Carolina. Convention (1788). Proceedings and Debates of the Convention of North-Carolina, Convened at Hillsborough, on Monday the 21st Day of July, 1788, for the Purpose of Deliberating and Determining on the Constitution Recommended by the General Convention at Philadelphia, the 17th Day of September, 1787: To Which is Prefixed the Said Constitution. 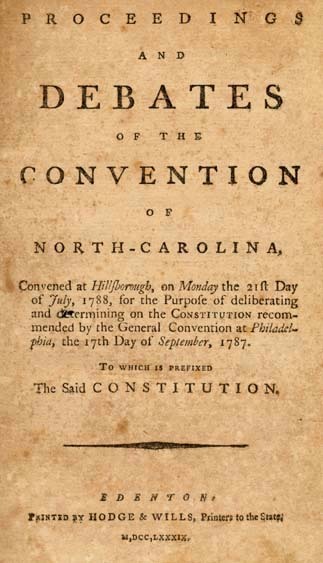 Proceedings and Debates of the Convention of North-Carolina, Convened at Hillsborough, on Monday the 21st Day of July, 1788, for the Purpose of Deliberating and Determining on the Constitution Recommended by the General Convention at Philadelphia, the 17th Day of September, 1787: To Which is Prefixed the Said Constitution. Edenton: Printed by Hodge & Wills, 1789.